Written for graduate-level students and faculty in health care science disciplines, this handbook will help integrate the findings in reports of primary qualitative studies as well as extrapolate the methods and techniques used to create a qualitative research synthesis. 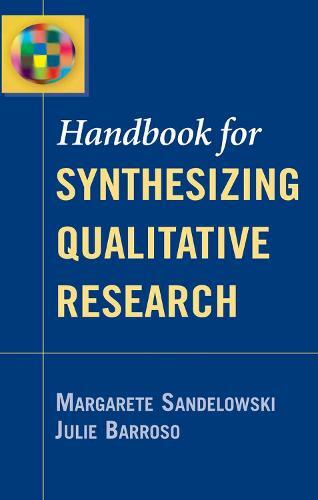 Using reports of studies in two domains of research and across behavior, social science, and practice disciplines, this handbook helps: locate qualitative research synthesis in qualitative research, research synthesis, research utilization, and evidence-based practice; locate the qualitative research synthesis enterprise in reading and writing practices; differentiate qualitative research synthesis from other forms of inquiry; formulate significant research problems and purposes for a qualitative research synthesis study; design credible qualitative research synthesis studies that fit available resources; conduct comprehensive searches for primary qualitative research reports in a target domain of inquiry; conduct judicious appraisals of these qualitative research reports; compare and classify findings across qualitative research reports; and, select methodological approaches appropriate to the content and form of the qualitative research findings. It also helps you to: use qualitative metasummary and metasynthesis techniques to integrate qualitative research findings; optimize the validity of qualitative research synthesis studies; and, present the results of qualitative research synthesis studies in effective, audience-appropriate ways.